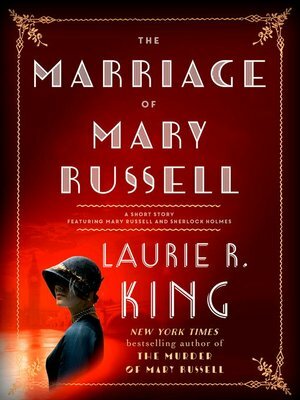 Laurie R. King takes readers way back in her bestselling series with this exclusive ebook short story, as Mary Russell and Sherlock Holmes embark upon the riskiest adventure of their partnership: their wedding. Includes a special preview of the highly anticipated new mystery from Laurie R. King, The Murder of Mary Russell! Though she cannot entirely discount the effects of the head injuries they were both suffering at the time, Mary Russell is delighted by Sherlock Holmes's proposal of marriage. After all, they have become partners-in-crime, and she has recently come into her inheritance: what remains but to confirm the union with her mentor-turned-partner through a piece of paper? Russell's pragmatic side tells her to head straight to the registry office—until Holmes surprises her with a sentimental wish to be married in the chapel of his ancestral manor. There's just the small issue of ownership: the house is not exactly his, and he is most definitely not welcome there. Of course, such obstacles have never deterred Sherlock Holmes before, and they certainly won't keep him from concocting an elaborate scheme to evade angry dogs and armed butlers—all in the name of wedded bliss.